Based out of Ocean Marina Yacht Club in Jomtien, just 2 hours from Bangkok, Blue Seas Yachting offers a day sailing trips and boutique bareboating charter services. Whether you are new to sailing and want to know where to get started or are an old hand and just fancy a day trip to refresh your sailing skills, Blue Seas Yachting can provide assistance. But what makes the Blue Seas Yachting experience different? Blue Seas Yachting shareholders and trainers are all active sailors & certified skippers, and we bring added enthusiasm and experience to your trips. 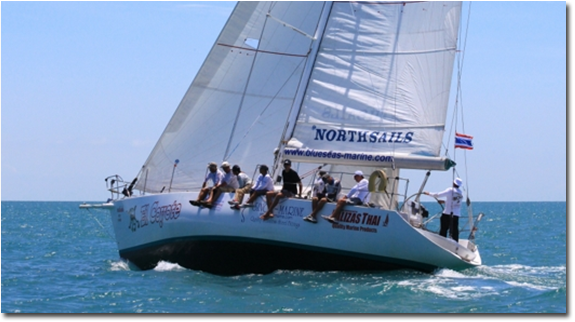 We enjoy promoting sailing as a sport and recreation, with the goal of furthering sailing in Thailand. We have been offering courses and boat charters in Thailand for many years and know the area and sailing conditions extremely well. Sailing in Thailand offers an experience like no other. Gorgeous tropical islands, beautiful sailing conditions for most of the year and clear warm water all make for a perfect sailing trip. Blue Seas Yachting is fortunate enough to be situated in Ocean Marina, Pattaya allowing us access to a number of isolated islands and picture-perfect beaches for our day sailing and great conditions to get sailing experience. Our fleet of superbly maintained yachts allows us the flexibility to take out groups as small as one, right up to larger groups of 60+ passengers.